Spacious Gulf Front Home ~ Large Wrap Around Decks ~ Spectacular Gulf Views! Fabulous View! Steps to the Beach and Surf! Minutes to Rosemary Beach and Alys! Fantastic panoramic vista with direct access to the Gulf of Mexico and your own private beach at this luxurious single family, three bedroom house. King bedroom with walk-in closet and private balcony, queen bedroom with private balcony, and king with deck. Two full bathrooms (plus outside shower room). Sleeps nine including futon sofa and new queen sofa bed in the living room. You and your guests will build beautiful vacation memories, as you experience your own private beach moments and chill on the huge deck overlooking the crystal waters and sugar white beach. You bring the sunscreen. Wifi, four flat screen cable/equipped TVs (one 60”), free movies, landline telephone, kitchen well-equipped with refrigerator, stove, dishwasher, ice maker, toaster oven, microwave oven, blender, etc.Dining room has a beautiful sunset view over the Gulf and comfortably seats 6-8 diners. The living room has two-story, floor to ceiling windows with the best breathtaking view in Walton county, a gas fireplace and a 60” flat screen TV with Mediacom cable. History of Sun n Surf ~ Back in the early 1950's, our Dad, “Papa Z” purchased this plot of beach land— it was really untamed, wild and bare bones. Growing from a one room cinder block cabin with hand pump water well, it’s become our favorite family vacation destination, complete with every modern convenience. We’ve been part time residents of Inlet Beach for many decades now, watching as 30A has become a preferred destination for beach-goers everywhere, visitors who love the restaurants and activities in Rosemary Beach, Alys and Seaside. And most of all, love the sand and surf! We know you will love your vacation at Sun n Surf, and hope you will return year after year to enjoy this special place. * SUNDAY TO SUNDAY RENTAL: March - November. We loved our recent stay at Sun 'n Surf! 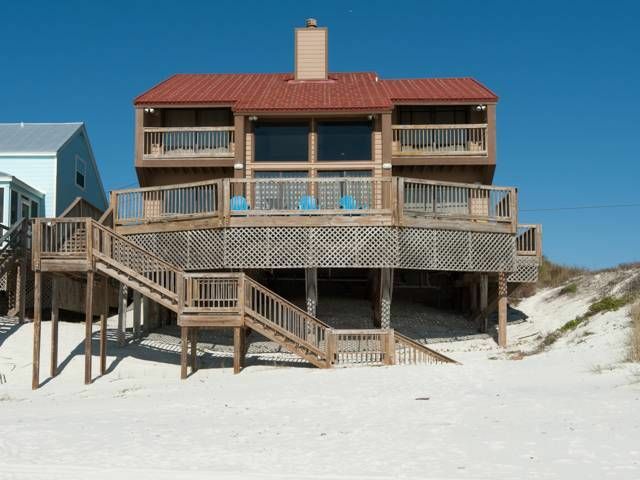 You cannot be any closer to the beach than this house at Inlet Beach. We also liked the fact we were less than a 5 minute bike ride in to Rosemary. We will definitely stay here again.